To make these Loteria knock-off flower pots first, I searched online for images that reflected my style. I used photo editing software to change the shape, size and color of some of the images. Next, I printed them and cut them to the size I needed to fit the clay pots. While they dried I painted the pots for each Loteria card. 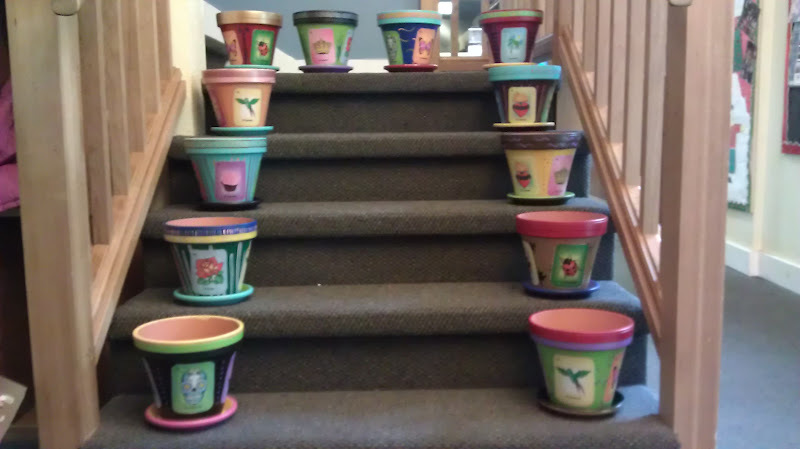 I made an image for each of four sides of the flower pots. That way they would look nice from every angle. I chose mainly bold colors that would clash when brought together. Then (after a few trial and errors) I sealed each design using contact paper. Just trim around the edge, it doesn't have to be perfect. Finally add a thin layer of mod podge under the image, place it in the desired location and apply more mod podge on the top, then all over the flower pot. It's not necessary to paint the inside or apply mod podge inside. After all, it will be filled with dirt! I made these for the teachers at my child's preschool. It is an immersion program so these were perfect for them!